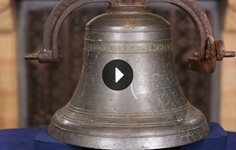 In Rapid City, South Dakota, a guest came to ANTIQUES ROADSHOW with what she thought was a 19th-century English cheese stand and cover that she'd bought at an estate auction for just $40. "I had read an article on majolica about two weeks earlier," she said. "When I saw the glaze, I thought it was a piece of [English] majolica." She was referring to the Victorian ceramic that was first made with a lead glaze manufactured by Minton that appraiser Nicholas Dawes describes as "colorful, rich and lustrous." From its introduction at the Great Exhibition in London in 1851 to about 1900, majolica (pronounced "mah-JOLL-ick-ah," with the accent on the "joll") was collected by the English upper and middle classes, and sold as plant holders, tableware, tea sets, jugs, and decorative items such as statuary and urns. If the guest was right about her hunch, she might have stumbled on a bargain — if an original piece of majolica, her purchase could be worth over $1,000. The production lines don't allow for the same degree of subtlety as for the Victorian pieces. The modern pieces are made very, very inexpensively. A real piece of majolica, a George Jones Game-Pie Dish, discovered at ROADSHOW's 2012 event in Myrtle Beach. Appraiser Nicholas Dawes and guest at the 2012 Rapid City, SD, event, sharing some unfortunate news. 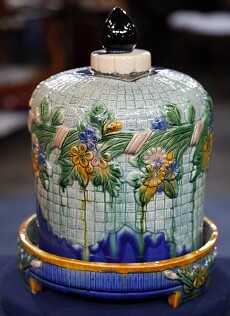 The imitation majolica piece, a reproduction Victorian majolica cheese stand and cover. Dawes immediately told her the bad news: her majolica wasn't old. Unfortunately, it was made just a few years ago, part of a new wave of English majolica imitations made in Asia, a recent market development that all majolica collectors should be aware of — and also beware of. Dawes explains that after 1900, when majolica was going out of fashion, the ceramic became a sleepy seller in the ceramics market. During most of the 20th century, many pieces, including the cheese stand and cover, could be had for a few hundred dollars or less. But that changed about 20 years ago, when many varieties of Victorian arts and crafts became popular again. A few books about majolica published at that time, including Dawes's book Majolica, also re-introduced modern collectors to the beauty of the ceramic. Demand spiked. "The prices were doubling and tripling in the space of a few years," Dawes says. "Fakes started appearing. It's all about supply and demand." Sometimes fakes are meant to hoodwink unsuspecting buyers, but in this case, they were only meant to meet demand at the low-end of the decorative majolica market. "They're satisfying the demand for designers, or if a hotel wants something in their lobby," Dawes says. "It's not fakery in the same way that manufacturers fake a Rolex watch. They're not trying to fool people. It's mimicry." Inexpensive majolica is often sold at import stores, but majolica sold at small auctions "can sometimes be trying to fool you," he says. We asked Dawes: How can majolica collectors be certain they're buying the real thing? The best way to spot modern imitations is to familiarize yourself with antique majolica by studying photos of originals or, better yet, attending reputable auctions where it's sold. 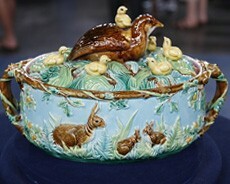 "The majolica today is clearly inferior to the Victorian product," Dawes says. 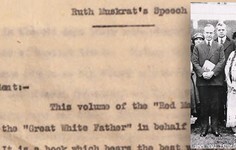 "They are second- or third-rate copies of the original. They shouldn't fool anyone with experience. But the untrained eye can be fooled." Some features won't help collectors distinguish classic majolica from cheap knock-offs. 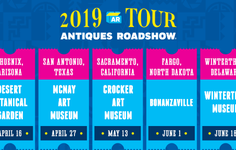 The shape of the majolica in Rapid City was clunkier than its original, but manufacturers are often spot-on about reproducing original forms, Dawes notes. 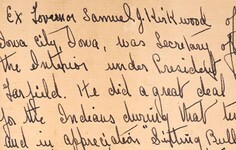 Relying on marks can also mislead collectors. The larger, well-established majolica manufacturers from the 19th century, such as Minton, Wedgwood, and George Jones, almost always placed their marks on the majolica they manufactured. But dozens of smaller manufacturers, such as Joseph Holdcraft, didn't mark their work. Today, Asian manufacturers usually don't mark their majolica, except when they add a fake diamond-shaped registry mark used by 19th-century English patent offices, further complicating matters. A better indication of majolica's authenticity is the color of its glazes. Those on the Rapid City cheese holder were more garish than those used in antique majolica. This is common, Dawes says, a result of the cheap glazes and the modern kilns used to fire majolica today. Also, the ceramic bodies that hold the glazes are "whiter and newer in appearance compared to the original," Dawes notes. And ceramics manufacturers today don't paint their objects with the same care as did the potters who made the nineteenth century majolica. "There's very little skill involved," says Dawes, noting that modern pieces tend to have far more dripping, a result of sloppy glaze application and quality control. "The production lines don't allow for the same degree of subtlety as for the Victorian pieces. The modern pieces are made very, very inexpensively. And they're often very, very sloppy." Dawes has one last piece of advice for the novice majolica collector. 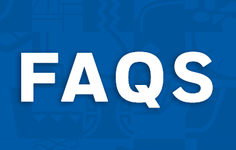 "If it seems very inexpensive and the price seems too good to be true," he says, "it's probably new." 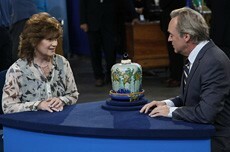 The ANTIQUES ROADSHOW guest hoped she had found an overlooked ceramic treasure, paying just $40 — about what Dawes says the piece was worth. If she'd been less lucky, her majolica lesson might have turned out to be a far more costly affair.